Here is a very short plug- I will be missing my own opening tomorrow night… if you are down in the Pioneer Square area between 5-8pm, please say hello to my gallery mates on their one year anniversary of operating Shift. It’s a nice group show consisting of all small works. I like this photo of Elise Richman’s work- she works in oil paint, slowly building up her surfaces- as you can only imagine the drying time. I’m so out of it, I nearly missed one of the biggest art stories to hit the Seattle Times in a long time. Last night, while picking up our take out dinner, the top of a stack of newspapers caught my eye as the the front page cover story touted: Paul Allen’s Experience Art Project. The story goes on to announce that Paul Allen will finally reveal a portion of the art collection he has been keeping secret all of these years….to be shown at his EMP (Experience Music Project) in the upcoming April. 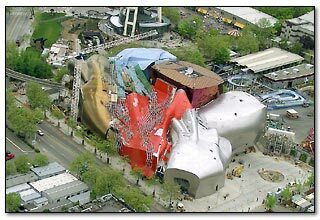 For those not from Seattle, the EMP is Paul Allen’s “museum of music” and in my opinion one of the most god-awful architectural blunders of modern day (Frank Gehry used a smashed guitar as the inspiration….) seen from street level, the building is like a garish piece of rubble. On principle too, I have never been to the museum as I find it offensive the place charges $20.00 a head, with never a free night or reduced admission evening in its fold. I have friends who have visited from out of town who went and loved it, but for the moment I stand my ground. Museum-studies professor Marjorie Schwarzer of John F. Kennedy University in Berkeley, Calif., sees Allen aligning himself with collectors such as William Randolph Hearst and Las Vegas developer Steve Wynn. “It’s positioning art and culture as spectacle,” she said. 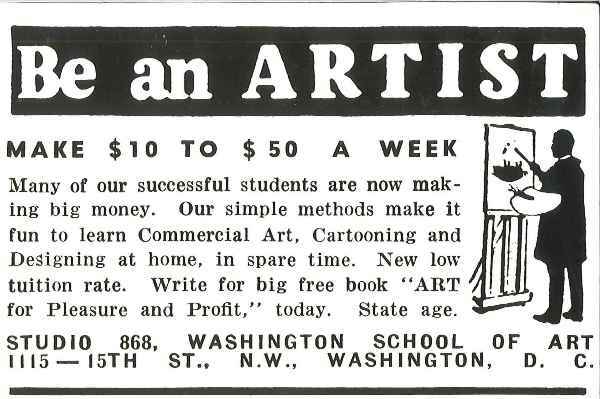 While I agree with the sentiment in the article that “Anything that boosts arts awareness in Seattle is a good thing” , there seems something strange about all the secrecy surrounding the collection…yet of course I will be there in April , breaking out my $20.00+ as curiosity has again killed the cat. Meanwhile in a few short hours I will be on my way to the North. 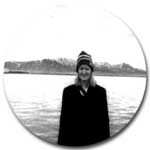 Back in February of 2001 I made a brief visit to Iceland, really just a vacation weekend, and fell in love with the place. And I promised I would go back. Well now I get my chance. I will be stationed in northern Iceland this time, in Akureyri, a town 60 miles south of the Arctic Circle (if I have my math correct). I will be the artist in residence at their Listagil Society’s Gueststudio. According to the weather map, the temperature is currently 24 degrees, not too bad considering that’s only 10 degrees colder than Buffalo, New York. The clincher is sunrise today was at 10:53 AM and sunset- was at 03:08 PM. Should be interesting. And I have no idea if I will have Internet access, but for certain I’m in for a change of pace. and The Iceland Report, including this little gem entry. By all accounts they look to be into the thick of winter season! I have never considered myself a minimalist, but maybe this is changing. Ever since I discovered Anne Appleby’s work last year, I have been in love with her calm, quiet paintings. She has such a touch with so little that I recognized her work immediately across the room when I walked into the Portland Art Museum earlier this year. 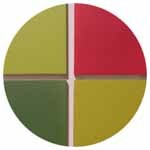 In her latest exhibit up at Greg Kucera, there is an addition to her color system of a very saturated pink which adds an odd vibrancy to the room. I think part of all of this is I have a certain fairy tale in my head about what Applyby’s life is like. I don’t know much about her except she likes nature and lives in Montana. The thought of living in some remote area and just painting, far, far away from it all is starting to sound more and more appealing. To everyone who comes here regularily, I’m thankful for you and wish you the best holiday wishes. Eva Lake: How Did You Get On Line? Yesterday I said I had been wanting to ask Eva a question for a long time, and so indeed I did- as follows is her response. CZ: I have been thinking about this for awhile, and please forgive me if the answer is in your archives. 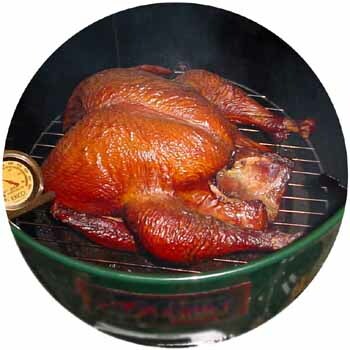 What prompted you to start your website, and what has been the instigation to keep it going? Just curious, there are not that many people who have been on line, especially in Portland as yourself! E.L.: Sometimes I wonder why. I really do. The major reason I began a diary online is because I have done the diary thing (in notebooks) better and longer than just about any other aspect of my life. There are times I did not exhibit art but I still kept a diary. I no longer dance but I still keep a diary. In the end, it seems I really am more of a writer than an artist, for I don’t actually make art every single day but I must write every day. Yet I don’t publish in a formal way like most writers. I don’t have any books out etc. I wanted to get it out somehow. Novels weren’t in me though, not any that I know of! Just the diary. But as Oscar Wilde says, he always has his diary with him, as he always wants something sensational to read. Of course there are other things in the website than the diary, but it seems to be the thing that is always there. the actual gallery Lovelake no longer exists. And Artstar Radio is sometimes on vacation and besides, it doesn’t relly need much of a website (a site of nothing but transcrpts would be cool but too much work). Anyway, I’ve looked at the numbers and by far the diary is the most popular element in the website. I figure I must be contributing something. Eva and I have been corresponding for almost a year now, and I had the pleasure of meeting her quite a few times since our first email. As you must know, Eva Lake is a Portland based painter, writer, radio show host/historian, gallerist and avid bird watcher. The first entry on line from her diary archives is May 2004, but if you read carefully you will find she has been doing this all of her life. A year ago I found myself boggled by the lack of on-line representation of the art scene in Portland, which seemed strange since the place was literally exploding with activity**. I was mainly aware of Eva’s site (which some time would be fun to ask her what instigated her on line activity) and NW Drizzle and of course Jeff Jahn’s site. Now I am talking about sites that were on my radar, not that things didn’t exist. Flash forward 12 months and there seems to be a veritable explosion of digests. I am just aware of Portland Public Art, a journal documenting the public art aspect of the PDX scene. Of course there isPORT, the mother ship of the Portland art vortex, and UltraPDX who I thoroughly enjoy….and god forbid many others everyday, which unfortunately I seem to have lost my touch in keeping up with. 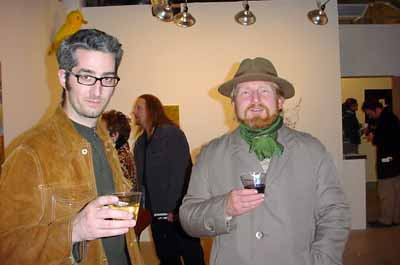 There are also tons of artists in Portland who have their own websites. 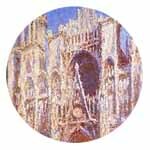 For a great index, check out Eva’s list of who she has previously had on Artstar Radio (scroll down a little). Amusement is a series of color photographs from Lucas’ road trips and travels. She often brings props and lets the environment around her dictate how they will be used. 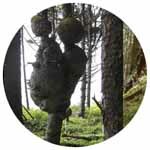 At other times Lucas captures nature on the sly, as when two fir trees bulging with burls are seen being intimate in ‘When The Forest Isn’t Looking’. Humorous self portraiture, an eye for the unusual and quirky use of animal figurines express a sense of discovery and playfulness she experiences while traveling. 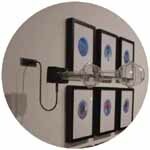 Lucas is an artist using photography and installation art. 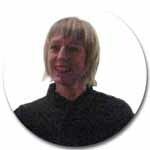 She is a co-founder of the artist collective Blinglab, and a recent recipient of the 2006 Caldera Artist Residency. 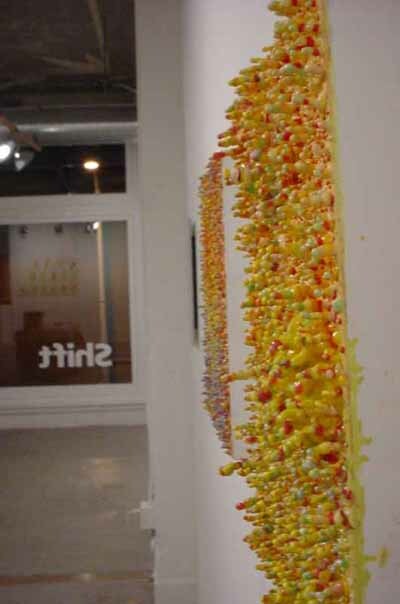 and one last thing, another exhibit Marne has work in (a group show) –Trippin’ Balls: A Mycological Exploration has been extended due to popular demand! If you are anywhere near V-Gun gallery in Portland in the next couple of weeks, stop in and give it a look. ** My conclusion: undoubtedly they were all making art and not tinkering around on the web…. 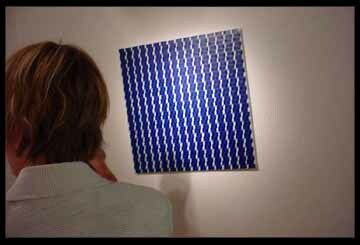 Last weekend was a great art viewing week- I just haven’t had time to digest it. Friday I went to two of my favorite venues in Seattle –Western Bridge and the Frye, never regrettful visits. Hopefully more to come about that- I think Crash. Pause. Rewind. has to be the best show up for the season here. Saturday evening, I dragged a sibling to the Thread Shop My-T event. WTF? It was a great and a complete departure from most, well I was going to say art events, but really a great departure from what you would do anywhere on a Saturday night. Held across the street from Thread Shop’s actual store, in a kind of rec-room venue- people milled about picking out art patches while music played, people swigged beer and sewing machine’s whirred in the back ground. It was great fun. As predicted, I went for the Polly Apfelbaum patch (I learned based on some political posters she had made last election) and my sister went for a couple, including the Maki Tamura. Later I felt a little regrettful in not choosing the Jack Daws, but we’ll live. It was a crazy rainy night and a strangely inviting way to spend the evening. On Sunday I toodled over to Ballard, Seattle’s fine Scandinavian neighborhood to visit the Nordic Heritage Museum. There was a great little Marimekko exhibit too, tucked away in the Finland room and put together by one of the Museology students from the University of Washington. The N.H.M. should be capitalizing on these funny little pieces of culture they have tucked away- I literally stumbled upon it and it was a treat. There were many displays focusing on not only the five countries of Scandinavia, but also the history of Scandinavian immigration to Seattle (and thus Ballard), impacting our logging and fishing industries. 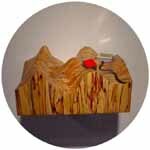 The main reason I went was to see the exhibit by Garth Amundson, in the contemporary gallery on the third floor. Amundson, as I mentioned last week, is a photographer who manipulates and crafts his own lens contraptions out of clear plastic. It was a bright sunny day when I was visiting and the installation looked very elegant in the light. Definitely worth checking out, and if you have lived in Seattle with out ever visiting this Scandinavian outpost in Ballard, you owe it to yourself! Afterwards I met up with my sister at the trendy Cupcake Royale . Even a few years ago people were still joking that quiet Ballard was for the “newly weds and nearly deads”, but I don’t think that is the case now at all. Here is a part of town I certainly don’t get over to enough: Ballard. 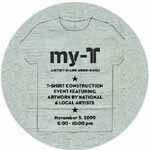 Tonight there is a good excuse to stop by as Thread Shop, the hybrid gallery/retail store is having a tee-shirt construction event tonight from 6-10. I was tipped me off to this event in a brief PI mention last week. The lure for me- Polly Apfelbaum is one of the featured artists being represented via a patch, along with other local and international artists. Thread Shop is located on 5000 20th Avenue NW. Including visits from artists and Internet champions Bre Pettis and Daniel Mount making their monthly gallery rounds. Seattle you have a real treat coming to you. Starting November 10th and running through Nov 16th, Northwest Film Forum is presenting the local premiere of the documentary William Eggleston in the Real World. William Eggleston’s color saturated, sublimely aimed photographs of common subjects should make for a mesmerizing visual film and it will be interesting to see what is in Eggleston’s head. It is rare for an artist of such stature to allow himself to be shown as unguardedly as Eggleston does in this intimate portrait. Almereyda tracks the photographer on trips to Kentucky, Los Angeles and New York, but gives particular attention to downtime in Memphis, Eggleston’s home base. –Palm Pictures. Last fall when I was visited the San Francisco Museum of Modern Art I happened upon Eggleston’s Los Alamos project, which was basically a retrospective of his photos taken between 1965 and 1974, as he traveled around parts of America. Much like Arbus (who immediately came to mind for me) there is much more at work in his prints than simple nostalgia and documentation of a certain time. 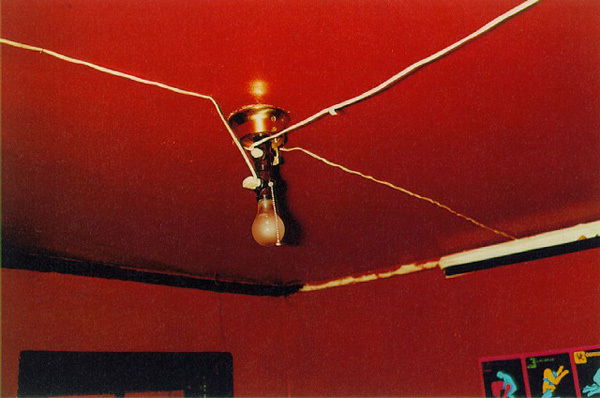 Eggleston gets at a certain psychology in his subjects, which he culls from using his “democratic camera”. I spent a long time examining and reexamining the photos and for some reason that is one exhibit that has reverberated long after seeing it. I was hoping this movie would be released soon, and now it is coming to our own fair town. 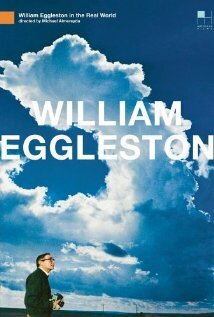 For more on William Eggleston, here is the official site representing his work.